About this time last year it froze outside and my water storage burst pipes. 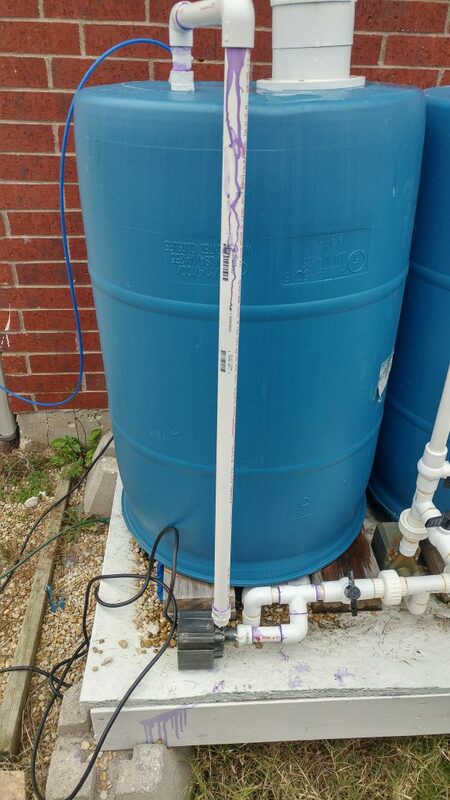 I told myself that I’d add a second pump to the fresh water storage so that I could recirculate the water in the tanks when it froze. I never got around to making this change, so I ended up doing it on Saturday in 40º temperatures. 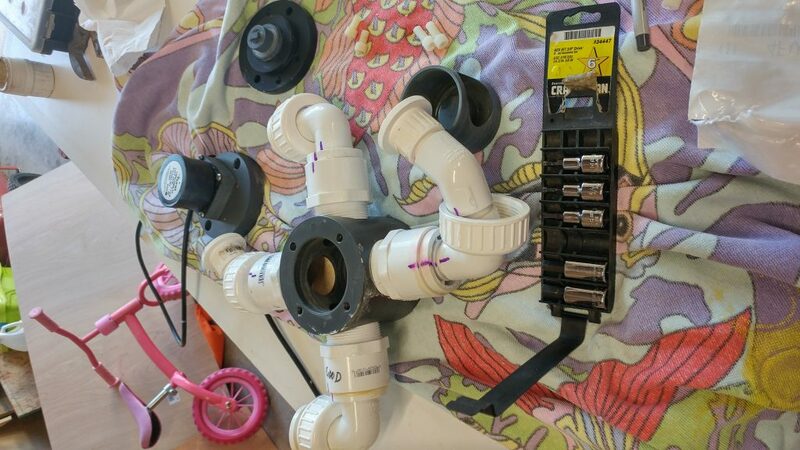 The pump was added very hastily and it shows in the quality of the work and the amount of purple primer you see on the pipes. Livestock-wise, everything is going well. I did have a mushroom split, so now there’s three. First the new Additions. Not sure what these three are yet, but I got them for a really good price. And updates on old. 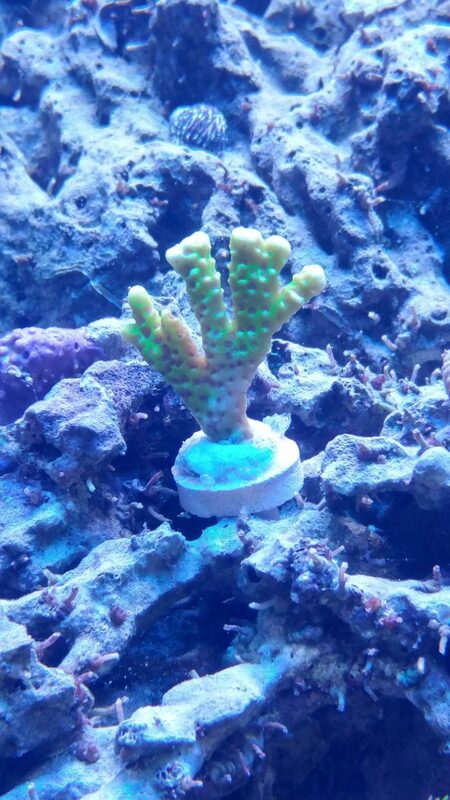 The Green Birdsnest is looking a little thin. It looks like some of it may be bleaching out. I made the mistake of touching it when I had to re-seat it in the epoxy. The Blastimossa is looking much happier in it’s new spot. It looks like I had it too close to the lights in the old spot. 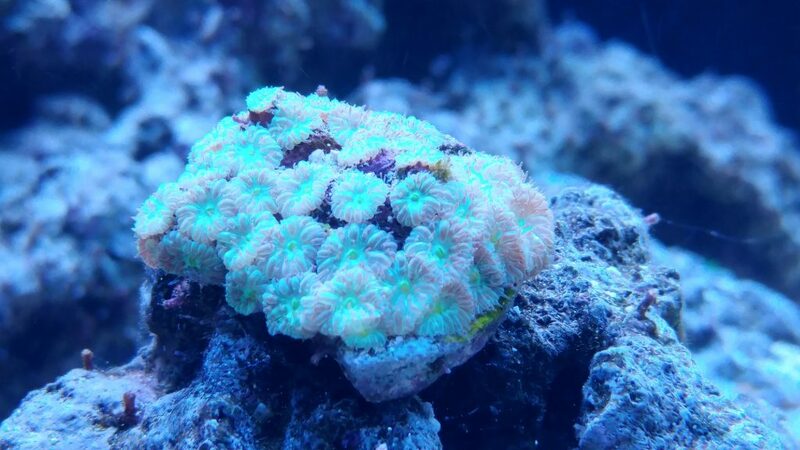 I also moved the Favia thinking it might like a spot with better water flow. 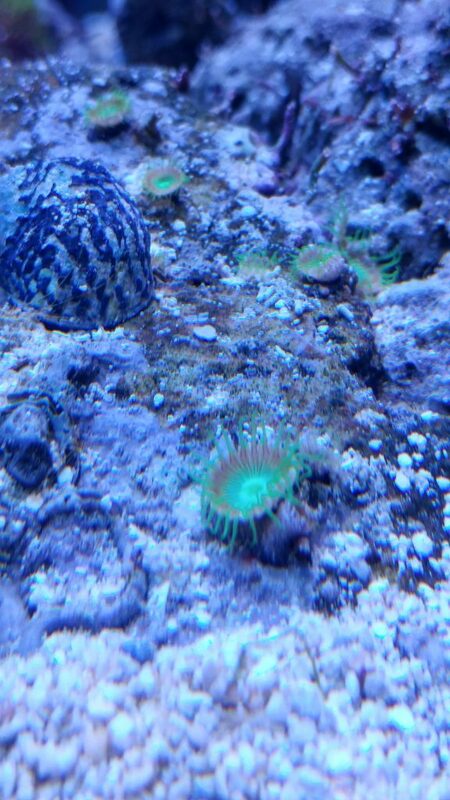 These Zoas have really started coming out and started spreading in the tank some. They were hitch-hikers and I never expected them to make it. 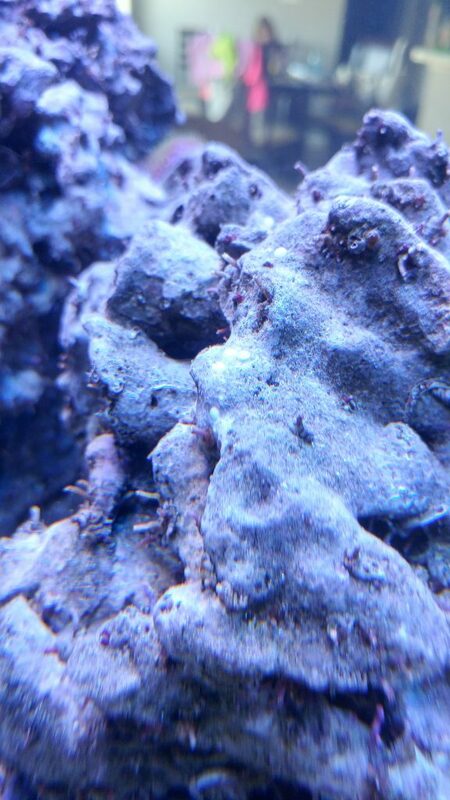 Lastly, I’ve started seeing a lot of these white dots all over the tank. 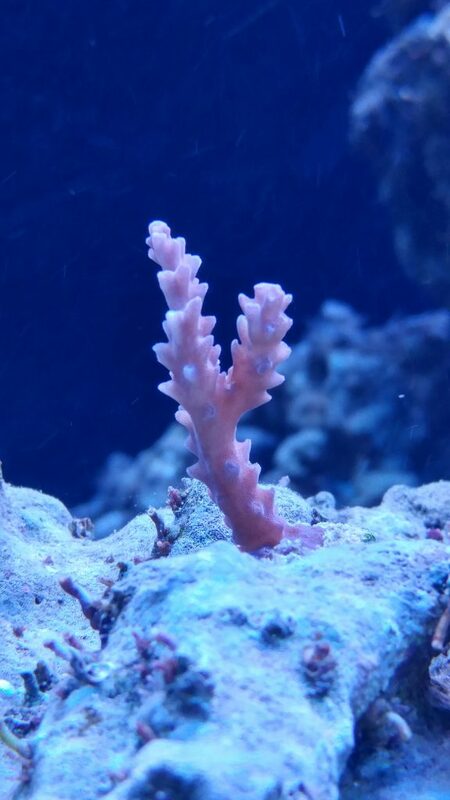 I think it’s just coraline algae starting to spread, but not sure. Wow. It might still be too early to tell, but initial results show that adding the fans to the tank seem to help quite a bit. 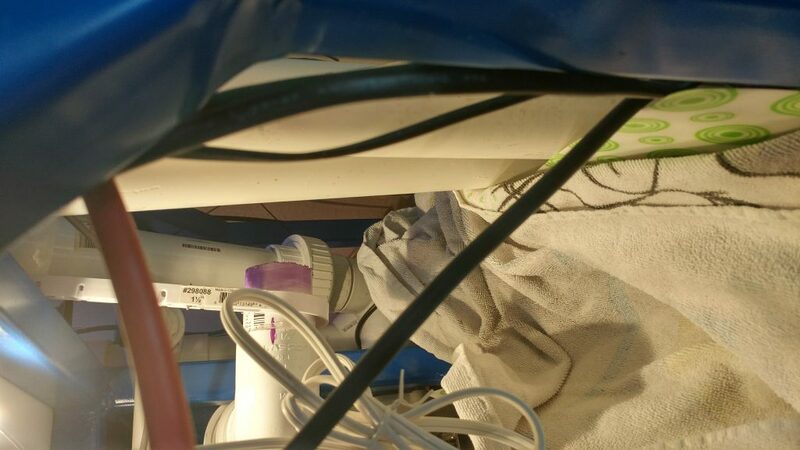 The tank went from regular flux to holding steady. I’ll probably add some logic to the circuitry to turn the fans on/off based on tank temperature. I don’t want the fans lowering the temperature too much at night. Maybe I’ll have them come on at 80 degrees and go off if the tank drops below 79. Then, if the fans can’t keep up, the chiller will kick on at 81. 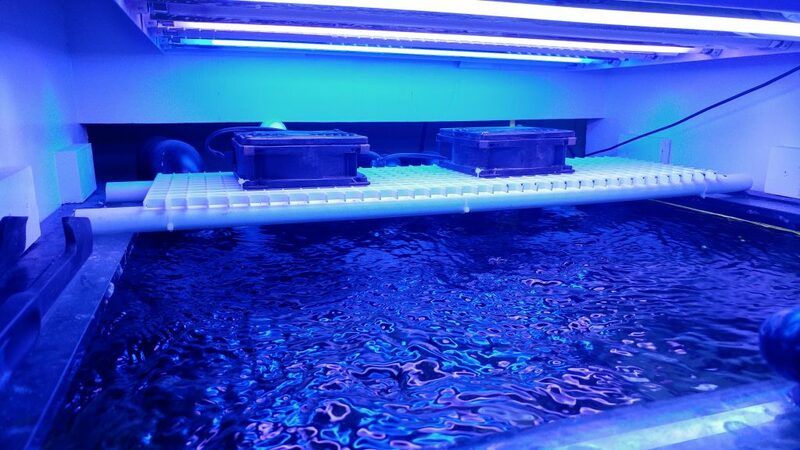 I finally added the chiller to the fish tank. It’s running quite a few times each day. I added a cleaner wrasse and some pajama cardinals to the tank. The cleaner wrasse tormented the cardinals until they were all gone… then it tormented my sleeper goby until it died… then the cleaner wrasse died. Once all those died, I noticed an algae bloom. Probably because I couldn’t find the sleeper gobie’s body. 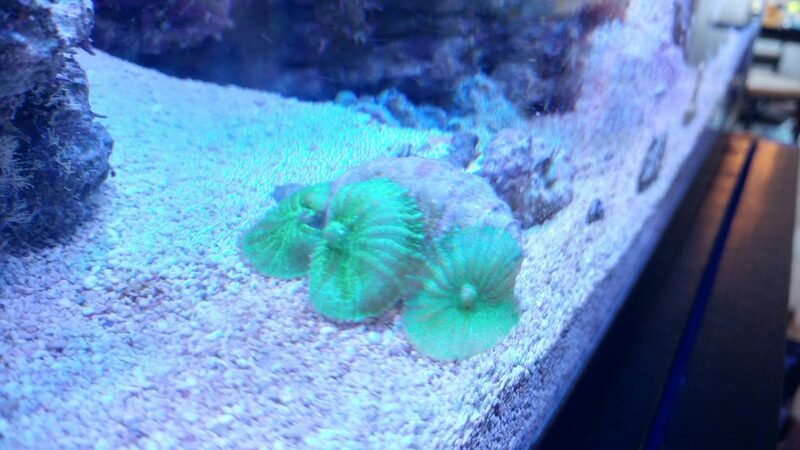 I did a few water changes but I think it’s still decomposing as the green star polyps are not fully extending. I did go ahead and add a dragon goby to help keep the sand turned over. 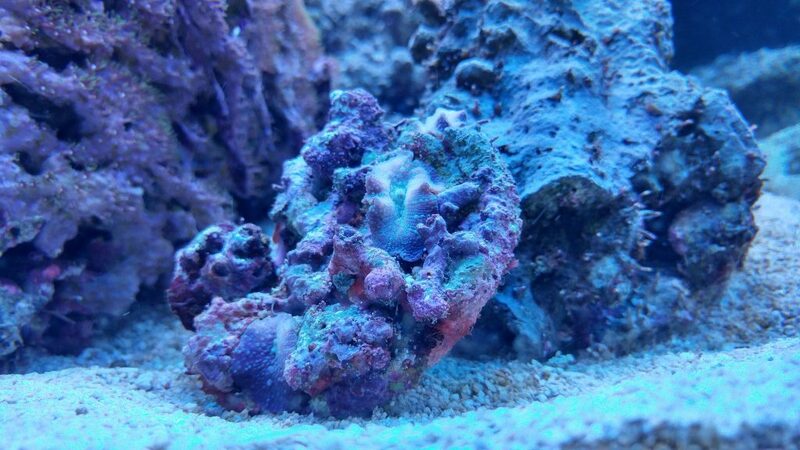 I was going to get another sleeper goby, but the store was out. The engineering goby is getting bigger. His stripes have switched from horizontal to vertical. I’ll try to get a picture in the next feeding. I notice he’s venturing out a lot farther during feeding time too. 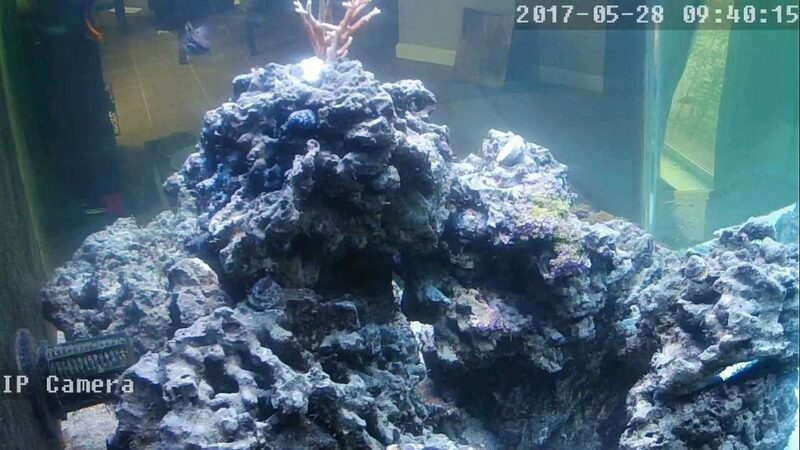 Lastly, I added a web cam to the environment. I’m still working on getting remote viewing to work. I spent the better part of the weekend setting up an ELK stack on my web server. 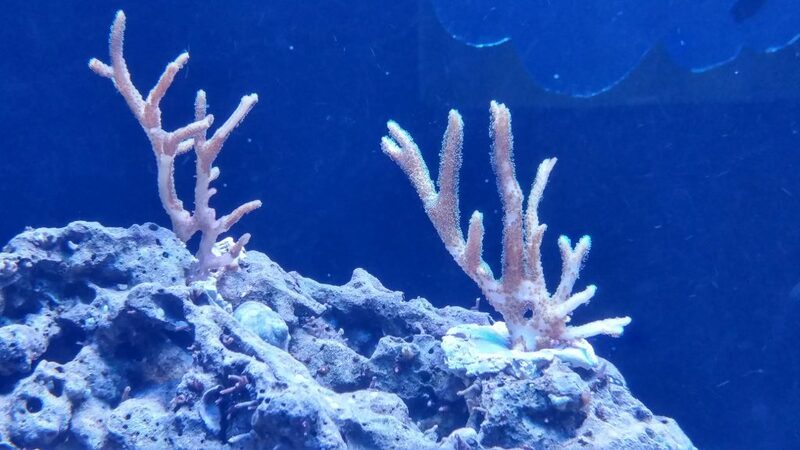 I’ve never been happy with the silly graphs my reeflog was producing. Mostly the fact that they were not dynamic at all, which made it very painful if I wanted to see something that was already graphed. I already have all the data going to a MySQL, and I’ve been searching for a better way of graphing that data. Thus enters Grafana. 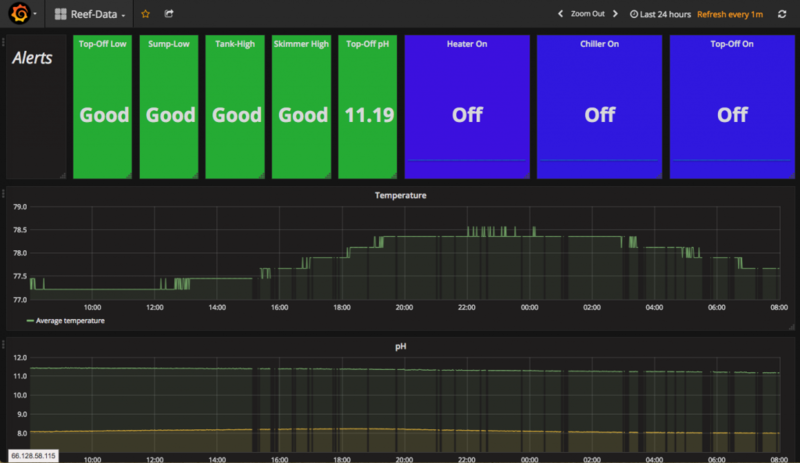 Grafana is an application that runs on the web server and can be used to alert, show and graph various timedate based data. Unfortunately it does not have hooks for getting data directly from a MySQL database. So, you install ElasticSearch. ElasticSearch is basically a nodb logging database that can take in data from endpoints and store it in an easily searchable fashion… But how do I get the data from the MySQL DB into the ElasticSearch. Next you install logstash. Logstash is yet another service that runs. You can configure various inputs and provide it various outputs and it will transpose the data from one source to the other. In my case, it logs in to the MySQL DB, grabs any data since the last update, and puts it into ElasticSearch. Probably the biggest thing I’ve learned since doing this is that the Wifi connection to the internet is spotty at best for my poor little Raspberry Pi. There’s quite a few times where it doesn’t get data up to the server. 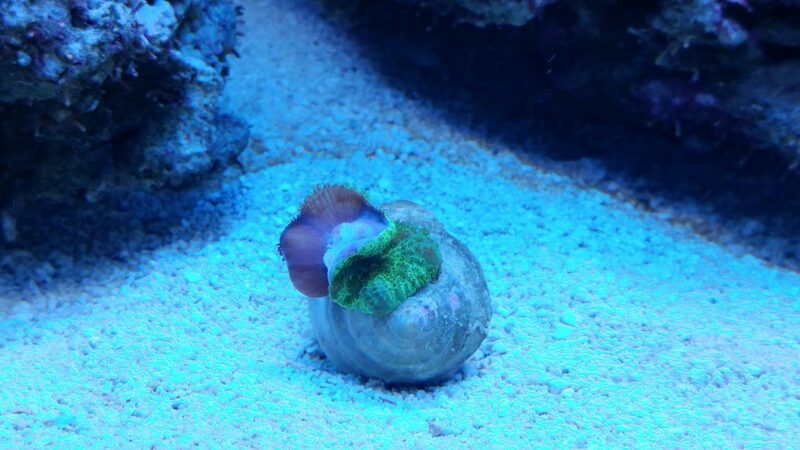 It doesn’t really matter… most things don’t happen quite that quickly in a reef tank. The one thing I probably miss out on is anytime the top-off pump runs as it typically only runs for a minute to begin with. 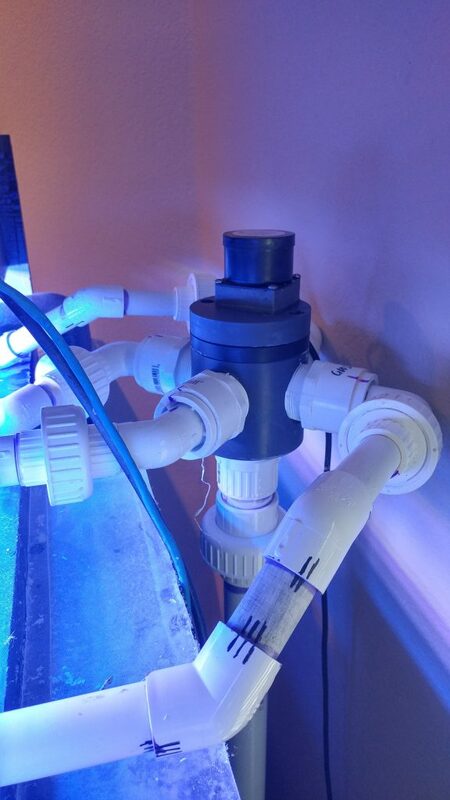 If I setup a kalk reactor like I want to, then I may switch out the pump with a doser. That would run slower than a top-off pump would and may get caught be the graph more often. Here’s a screenshot of the current dashboard. Alerts are at the top. pH and Temperature are graphed at the bottom.